I don't feel well. I even left work early tonite because I didn't want to risk making a mess. Whether this is a virus or merely an adverse reaction to something I ate I know not but I'm glad I was able to leave when I did. Without an occurrence, even. I've been tired today since I ate a little too much for lunch. I had some ups and downs but by six o'clock I was ready to sleep so I delved into my supply of Penguin caffeinated mints in hopes of getting some energy back. I didn't. I took a fifteen minute nap on my second break at seven thirty and once I woke and moved around for about half an hour I wasn't as sleepy. However, I now felt queasy and nauseious. Over the next hour it increased until I was afraid to make any sudden movements because I didn't know how my stomach would react. I felt as tho' my innards were steadily liquefying and after the third trip to the men's room I called it quits and asked to leave. The first think I do when something like this happens is try to think of all the things I've eaten over the last 24 hours. Food poisoning doesn't happen fast so it's unlikely that the last thing you ate (in my case, a deli meat sandwich from the machines at work at four thirty) is at fault. As I recall it's something like six to eight hours after the consumption of tainted food before it rears its ugly head. That would be my lunch: a leftover hamburger from dinner with the parental units last night, and a couple hot dogs. All of which unlikely as I had already eaten portions of each long enough ago to know by now if they were bad. So, a virus? I don't know yet. I'll have to wait and see if this persists. The only other thing I can think of are the Penguin mints I ate to try to wake up. (If anything, I was even sleepier afterward.) But is something like that ok to consume on an empty stomach? I had about seven over the course of an hour and a half; enough to equal the caffeine of two cans of cola. I'm going to lay off until a) I feel better and b) I find conclusive evidence either way. Matt might now. In other news, last night I learned not to leave my living room window open when the black light is on. I was heading to bed when I saw that a multitude of tiny bugs had managed to get through the screen and onto my windowsill and CD rack, the latter props up my black light. It was disgusting. I normally try to leave bugs alone but I do NOT like them in my home. Needless to say I slid the glass down over the screen and spent the next ten minutes swatting the things with a rolled up copy of the newest Onion. Yuck. Saturday night was a blue moon, did you see it? It rose a deep red/orange and as I stood atop my shed in awe I formed an ellipse with my thumb and forefinger and held up my hand to make the moon a sinister eye. The clouds accented it nicely and I regret not having a camera that can take night photos. It was quite awesome and I won't soon forget it. Sunday I called Jon and we went for lunch at Noodles and to do a little shopping at Best Buy. I called the store before leaving town to confirm the sale and the gent in the department told me only six titles were on sale. I was disappointed but had nothing better to do anyway so we still left. I bought four titles, two anime and two non-anime being: a Slayers movie, "End of Eva," "Pink Floyd: Live in Pompeii," and "Roger Waters: The Wall, Live in Berlin." It wasn't until we were leaving the store and checking receipts when we found that the anime we had purchased -- none of which being of the six --- were indeed discounted. The guy on the phone was an idiot. It's just as well. I didn't see many volumes to complete my current titles and I might have overspent had I still believed in the sale. But I'll still probably go back again someday this week. Goodbye money, I'll miss you. My manager usually uses photos from her sister's travels as wallpaper on her computer monitor. 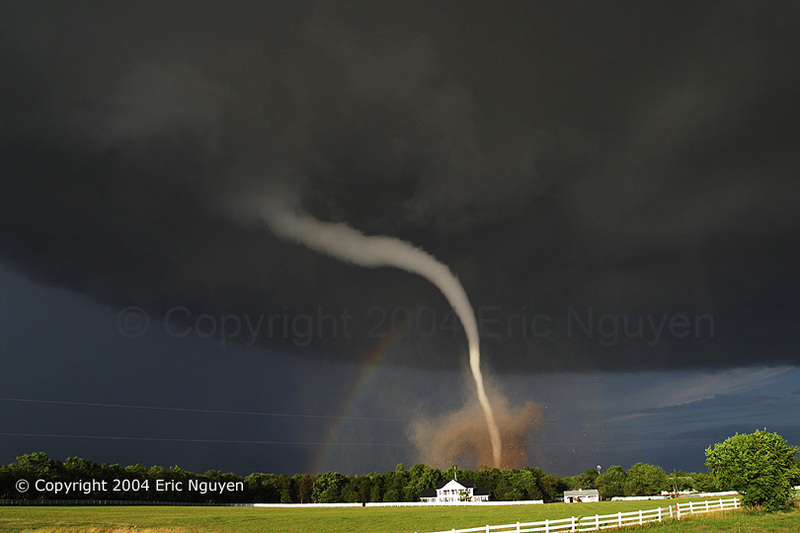 But today it was of a beautiful tornado that struck near her home town in June. I asked her to send it to me. I've bookmarked the webpage. I love storms. It's the largest show you can ever witness and you can immerse yourself completely. The change of air and temperature, the wind and rain combined is one of the most refreshing things I can experience. Mmmm. I just noticed the coincidence that I was woken this morning by thunder and light rain. It didn't ammount to much but I was glad to have heard it. I can somehow sleep through the heaviest thunderstorms and yet any unnatural sound in the room will have me wide awake. Then again, maybe I sleep through most of those too. Remind me to sleep with the doors locked. The Megagear store opened while I was refreshing (the web page) last nite. I immediately created an account and started shopping. I haven't bought anything yet tho' since it occurred to me that there may be discounts to celebrate I decided to wait a couple days. I got two new wall scrolls in the mail today. The postman knocked during lunch and surprised me with a big, long triangular tube. To be honest, I had momentairly forgotten they were due so this made a nice surprise. My collection has now expanded to six with the addition of three charcters from Onegai Sensei to replace one from Mitsuwa that I wasn't happy with and my new favourite from Full Metal Panic which I will not describe here lest I spoil the surprise of my guests. I like wall scrolls, despite the fact that the colours aren't as vivid as what can be printed on paper. They're easy to hang and move so I rotate mine around now and then and a great way to display otakudom anime. I called Grandma earlier today since we didn't get to vist over the weekend due to her cold. I guess she's on the mend but still started getting hoarse toward the end of our conversation. She had been to a relative's wedding the week before and four days later she had this. I hope she recovers fast. I always worry now when she's ill because she's over eighty. She still lives at home and does all her own cooking and cleaning which is great but I don't want to get morbid here. We had a nice conversation and I'll be visiting soon once she's well and ready for company. I think I've run out of ammunition. All that's left is stuff I need to remember to do this week which I don't really need to put down here. Must remember not to sleep through my doctor's appointment again, tho'. It was scheduled long before I fell ill tonite but it will be good timing if I don't feel better by morning. I know I must be really dehydrated right now but the thought of drinking or eating anything makes me nauseous again. Hmm. Since I've had Evangelion on the brain for a while I may try to squeeze in the last three remastered and extended episodes. Live Journal really needs a better way of letting us spell check our entries. I get tired of scrolling up and down the "Update Journal" page and continually losing my place in the tiny text window. When I spell check my email it displays the full text and a dropdown menu with suggestions next to every questionable word. That would make things much easier here.